Well, I got all my panel parts, but it looks like my panels for the rest of this first batch of modules won't be here until Tuesday at the soonest! Bummer... I was spoiled by having a coupon code for the 3-day service from Front Panel Express last time! 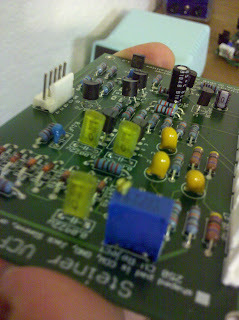 Anyhow, as I mentioned before I wasn't too happy with these ceramic capacitors (MLCCs) that I'd picked up. They seem to be working fine on the modules I've completed, but there's three .0022u caps on the VCF that are ceramic, but that could (potentially) benefit from better caps. So, I decided to replace them with polyester metallized film capacitors.